If you think that technology is a high-speed shooting are already at an incredibly high level, and there's nowhere to grow, we suggest you think again. 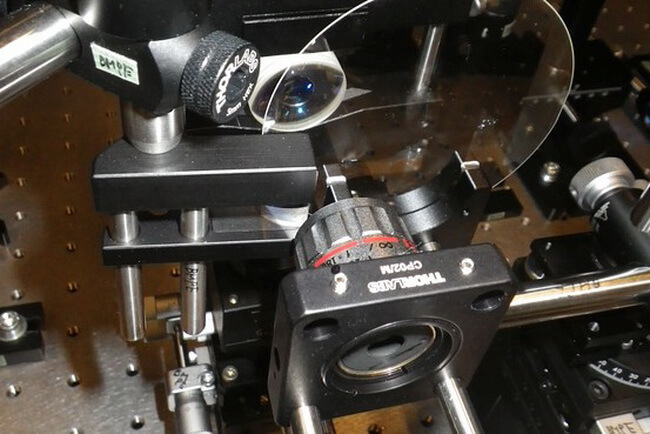 The fact that two Japanese university (the University of Tokyo and Kyoto University) have developed a new camera that is 1000 times faster than the most advanced camera is intended for high-speed shooting. It is so fast that by using it in a single frame can capture even chemical reactions. "The principle of this method - femto photos - is an all-optical mapping of the time-varying spatial profile of the withdrawn targets simultaneously at all consistently create an image of the object based on the temporal and spatial dispersion." In other words, the camera does not have to re-set time and create an image of the object, and it can increase its recording speed in comparison with conventional high-speed camera to 1000 times. The new camera is very cumbersome - it takes roughly about one square meter of space. However, the size is nothing if we are talking about the possibility of photographing the actual speed of light. With the new camera, scientists were able to obtain images of processes, visualisation which previously was not possible within the framework of a single shot is. We are talking about chemical reactions, or, for example, the process of heat transfer (conduction). Heat transfer, for example, occurs at the rate of about 1.6 of speed of light.